Run Time:123 Min Rated: PG (Canada) Rated PG-13 (MPAA) for intense sequences of destruction, mayhem and creature violence. In whom do you trust? A monster-sized question. Building on the original 1954 Godzilla and other early Godzilla filmsdirector Gareth Edwards has made the Godzilla movie people wanted to see. He gives the audience a streamlined story that draws the human elements of the film into the foreground while simultaneously asking some deeper questions. Godzilla remains faithful to the look of the original film while effectively updating the source material for a modern audience. The film tells the story of enormous dormant, strange creatures who, through military and scientific agitation, become active wreaking havoc wherever they go. Godzilla is one of these monsters. At one point in the film a media headline reads: "Godzilla King of the Monsters — Saviour of Our City?" The question mark is important because Godzilla isn't only a film about Godzilla, it's also a film about people stuck in the middle of a near 'apocalyptic' disaster. Aaron Taylor-Johnson who plays Lieutenant Ford Brody, a navel explosive ordinance disposal officer, is just as much a saviour character as Godzilla. In fact, there are a number of points where director Edwards consciously links the monster and human protagonists within the story. In part, this provides a way "in" for the audience; Edwards is saying that the 'antlike' human characters are not simply cannon-fodder for Godzilla but are a part of the equation. Having them as part of the equation then becomes important once the sum of the film’s parts is added up. There is one other important detail to consider as the deeper questions in Godzilla begin presenting themselves. Where the original 1954 film was born out of a specific fear of nuclear weapons, the current film includes an underlying fear of loss of technology, a fear of having to face 'nature' on nature’s terms with no tools, no technology. The fear in Godzilla(2014) is not immediate death but rather a diminished quality of life. The monsters have the biologically induced effect of knocking out electrical power by their very presence thereby effectively stripping modern humankind of its most prized advantages. Being stripped bare of the best technology reveals one of the big questions underpinning the film: What is man’s place in nature? The answer is left in the viewer’s hands and will be informed by the viewer’s worldview. In the film, Edwards presents two scientists with competing worldviews. These two characters help dig into some of these deeper questions. The first scientist, Joe Brody (Brian Cranston), the father of Lieutenant Ford Brody, is a nuclear power plant engineer who suffered the loss of his wifein a sudden disaster. Joe Brody is suspicious of the official story of what happened saying, "You're not fooling anybody when you say that what happened was a 'natural disaster.' You're lying! It was not an earthquake, it wasn't a typhoon! Because what's really happening is that you're hiding something out there! And it is going to send us back to the Stone Age! God help us all..." In his grief Joe Brody introduces God into the equation. The second scientist, Dr. Ishiro Serizawa (Ken Watanabe),who has long been embroiled in the exploitation and cover-up of the monsters, in a moment of reflection says "the arrogance of man is thinking nature is in our control and not the other way around." 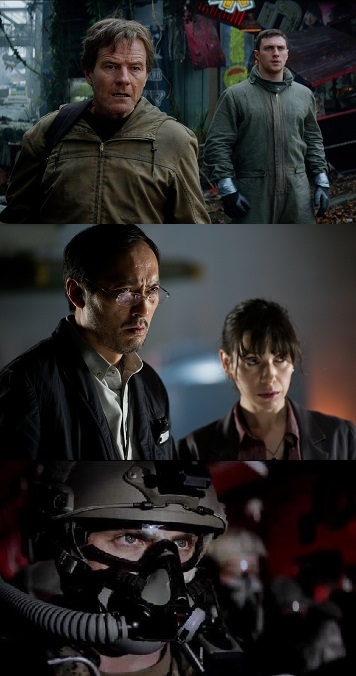 At one point in the film Dr. Serizawa's assistant Dr. Vivienne Graham (Sally Hawkins) says that Godzilla is "a god, for all intents and purposes." Dr. Serizawa and his assistant subtract God from the equation. Later in the film God comes back into the picture when a paratrooper prays to the Lord before a dangerous jump into the path of Godzilla's destruction. His prayer is personal and shows the conviction of his faith within his vocational duty as a soldier. The paratrooper is not praying to Godzilla, neither does he pray to nature. This short scene presents a Christian worldview and is a significant point to consider because it shows a confession of faith in which God is in control, not nature and not man. That short prayer is a Godzilla-sized neon sign pointing to a traditional Christian order of creation: God is the Creator who makes and sustains all things; men and women are the pinnacle of creation; God gives them dominion over nature. This worldview is in stark contrast to one in which there is no God and mankind lives at the whim of nature. This brings us back to the film’s media report that labels Godzilla as "Godzilla King of the Monsters — Saviour of Our City?" Unlike the irrational gigantic beasts of last summer's Pacific Rim (2013), Godzilla is shown as a defender of sorts. Under its scaly exterior there appears to be some kind of moral compass. This nod to a worldview that includes right and wrong potentially makes Godzilla into a Leviathan on a leash.The next question is: Who is holding the leash? A viewer’s belief in a Creator God has the potential to inform their outlook on Godzilla. God's words to Job may come to mind, "Whatever is under the whole heaven is mine. "In the context of the film that would include Godzilla,Lieut. Ford Brody, the paratrooper, even Dr. Serizawa and his assistant Dr. Graham and everyone and everything in the film. Where movies like last year's Man of Steel (2013) failed in dealing with the human side of tragic disasters, Godzilla does a better job. From first responders to school bus drivers to military personnel to FEMA, people are shown working faithfully on behalf of others in need. The concrete nature of the film drives that point home in a unique and positive way. As in the recent film World War Z(2013) there is also a positive depiction of a traditional family in which ultimately the family is strengthened in the midst of trouble not broken by it. Overall the film will be too intense for many young and/or sensitive viewers. However, in the middle of the spectacle that is Godzilla, viewers of every stripe will have an opportunity to ask where they place their trust—in God, in man or in nature? Rev. Ted Giese is associate pastor at Mount Olive Lutheran Church in Regina, Saskatchewan. You can also find this article featured in the Reporter online. like Godzilla Raids Again, 1955, "Gojira no gyakushû" (Original Japanese title) and Ghidorah, the Three-Headed Monster, 1964, "San Daikaijū: ChikyūSaidai no Kessen" (Original Japanese title). Called MUTO (Massive Unidentified Terrestrial Organism) in the film. The father of Lieutenant Ford Brody. The mother of Ford Brody. Ken Watanabe is best known for his roles in movies like The Last Samurai 2003, Batman Begins 2005 and Inception 2010. Sally Hawkins received recent critical acclaimed for her work in Blue Jasmine 2013 which garnered her an Oscar nomination in the Best Performance by an Actress in a Supporting Role category. Genesis 1:28 "And God blessed them. And God said to them, 'Be fruitful and multiply and fill the earth and subdue it, and have dominion over the fish of the sea and over the birds of the heavens and over every living thing that moves on the earth.'"